Driving through Surbiton Hill ward yesterday I encountered flooding such as I haven’t seen in years. I notice that James Berry MP posted a picture of it outside his office in Ewell Road during the down pour. This used to be a feature of life until Jane Smith, Janet Bowen-Hitchings and I campaigned successfully to get all the gullies cleared regularly. First we had to get the Highway engineers to map their locations accurately. Some were choked with silt in which grass was growing and one outside Bourne House in Langley Avenue was blocked with cement! Yesterday Upper Brighton Road near St. Matthew’s Avenue was a lake for a while – something I’d never seen before. I was glad to see that some of the other former flood areas were clear thanks to functioning gullies and drains. But would our successors please note: the price of dry roads is perpetual vigilance to see that the drainage system is properly maintained. I suppose like me you are tired to death of the ‘Neverendum’ and may be inclined to disconnect the TV and every other communication device within earshot, recycle the paper and go to sleep in a darkened room. The campaign has shown our politics at its worst. 1975 was nothing like this, nor was any General Election I can remember, going all the way back to 1964. However, one thing I have ended up more convinced about than I ever expected to be is that we simply must not take what Cameron and the Remainers want us to believe is the safe, easy option and vote to stay in this dysfunctional ‘Union’ or bury our head in the pillows and just abstain. If you ever want to have a real choice over who governs us and how – something we took for granted in those earlier General Elections – then you must go out and VOTE LEAVE TODAY. In 1975 I campaigned for YES to stay in. To stay in what? I’m not going to say that I thought it was just a free trade area and no more because it wasn’t. It had political overtones even then. But the world of 1975 was entirely different to today. One quarter of Germany, all of Poland, Czechoslovakia, Hungary, Bulgaria and Romania were behind the Iron Curtain and controlled by the Soviets, who had sent tanks to crush reformers in Prague as recently as 1968. Yugoslavia (who??) and Albania had Communist dictatorships. Latvia, Lithuania and Estonia were still part of the Soviet Union. Spain and Portugal were just on the verge of ending Fascist dictatorships that had held power there since the 1930s. The European Community we had joined had within it France, West Germany, Italy, Belgium, the Netherlands, Luxemburg plus Denmark, Eire and ourselves. Norway should have joined but decided not to. Essentially we were the democratic, free market states of Northern Europe and also (except for Eire) members of NATO. Closer economic and cultural co-operation between ourselves and our like-minded neighbours made sense. Besides which the UK was in serious economic trouble with strikes and serious inflation and the other members seemed to be doing better economically than we were. Truly some ‘visionaries’ might have nursed ambitions to recreate the Roman Empire – some sort of European superstate – but that seemed unlikely ever to happen and in no-one’s interest that it should. By being in, we, with our ties with the Commonwealth and the USA, believed we were in a position to stop it anyway. Since then the Nine, as we were in 1975, have grown to 28. The Iron Curtain has gone and most of the states that were formerly behind it have been allowed by Brussels to join the EU (as it became through the treaties of Maastricht and Lisbon and they have changed the whole character of that body simply by being allowed to join it. Brussels has pretended that each of them has changed its policies and laws since the days of its Communist past sufficiently to rank it alongside the Western countries that never had a Communist (or a Fascist) past in the first place. The basis for this is territorial aggrandisement pure and simple and as fast as possible so as to advance the cause of the Superstate which is no longer just a pipe dream but which they are desperate to create as soon as possible. This attitude is no more clearly revealed than it was over the Euro, created not as a common currency, as many commentators inaccurately call it, but as a single currency. Effectively this has meant replacing the lira, peseta and drachma with the Deutsche Mark under a different name and assuming that the economic policies that made Germany’s currency the strongest in Europe could be applied (irrespective of the wishes of their citizens) in all the states of the Union. We and the Danes have opted out, thank the Lord, but we have, nevertheless, had to pay out millions to shore up the Euro and save it from collapse. Meanwhile the peoples of Southern Europe are paying a heavy price in terms of unemployment for this nightmare experiment and we are rewarded for our abstinence from the Euro by massive migration and the consequent strain on all our social and other services and the pricing of young people out of the housing market.And can we be sure that we can indefinitely stay IN the EU but OUT of the Euro? The EU is headed down a path we and most of the citizens of other member states never asked for or agreed to. The Remainers have made no case at all why we should continue along this path with them. David Cameron has shown that the people who actually run the EU are not prepared to countenance any change of tack, believing that we don’t really care. All Cameron and Osborne have done is to try to scare us with horror stories about leaving, in a campaign which has crossed the borders of hysteria and mendacity more than once. I wish they’d shown more wisdom and restraint and soon enough I think they will wish so too. We owe it to ourselves and our children and we owe it to all the people in Europe who are suffering to take our future into our own hands and serve notice that we will no longer let the bureaucrats of Brussels take us for granted. FOR ALL OUR SAKES VOTE ‘LEAVE’. Our friend Pinocchio has been at it again during this Election campaign. I was intrigued to note early on that he was even spotted by the Labour candidate, who even called him by this name when listing his various achievements of the last 18 years. There has been the recurring theme of moving Surbiton Station into Zone 6, now enjoying its fourth General Election outing – and still nothing done! Then of course there’s the Great Hospital Scare of 2010, now having a well deserved re-run as the heroic tale of ‘How I saved the Hospital from the Non-existent Threat’. I guess this is due for a quinquennial re-run if he gets the chance! One of the features of the latest burst is the bit about ‘How I’ve been a Minister in the Government of the Ghastly Cameron for the last five years.’ Not that he says Cameron is ghastly in so many words, nor does he trouble to explain how he managed to maintain his political purity while just having to accept the Ministerial salary etc that went with it. I feel a lump coming in my throat at the very thought of it! Shock!! Horror!!! Nigel himself hadn’t thought of that one! 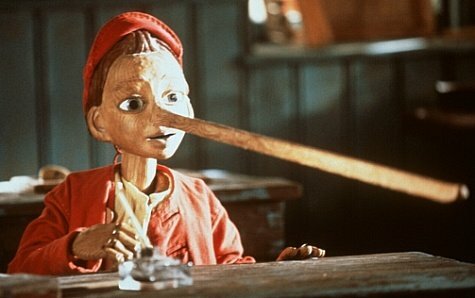 That’s right, in Pinocchio’s little world of makebelieve, a Tory hold in Thanet South, or the recapture of Clacton or Rochester brings us nearer to an alliance with the very people we will have ousted. Once more, friend Pinocchio is hoping enough people will be taken in to vote him back into the House and (just possibly) to another five Ministerial years in Coalition with those awful Tories!